This highly educative discussion is on how the globalisation of NATO is affecting Africa. Our expert guest is, MAHDI DARIUS NAZEMROAYA. Mahdi is an award winning author and global geopolitical analyst. He is also a sociologist and research associate in different regions of the world. 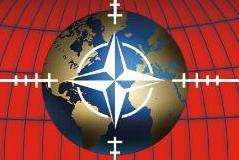 NATO developed from a supposedly defensive and North Atlantic organization into an predominantly offensive, aggressive and global one. We will look at NATO’s interventions in Africa historically right through the years to modern times, like in the “Arab Spring” which affected nations like Libya. Evidence shows that NATO has been progressively destroying Africa over the years, though mainline media would report otherwise. The re-colonization of Africa is under-way through NATO and European Union expansion. Our guest, Mahdi is very generous with knowledge, you are encouraged to tune in with an ear ready to learn. We will also discuss his book, “The Globalization of NATO”. The show is concluded by applicable biblical perspectives. Heart of Africa is broadcasted live every Wednesday night at 2000 hours Central Africa Time on www.morelightradio.com. It is dedicated to examining matters that affect Africa from a Pan-African Christian perspective, as we envisage the revival of the African dream. All rights reserved.